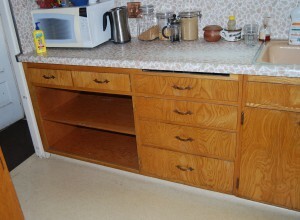 We’re doing a renovation of our 1963 kitchen. 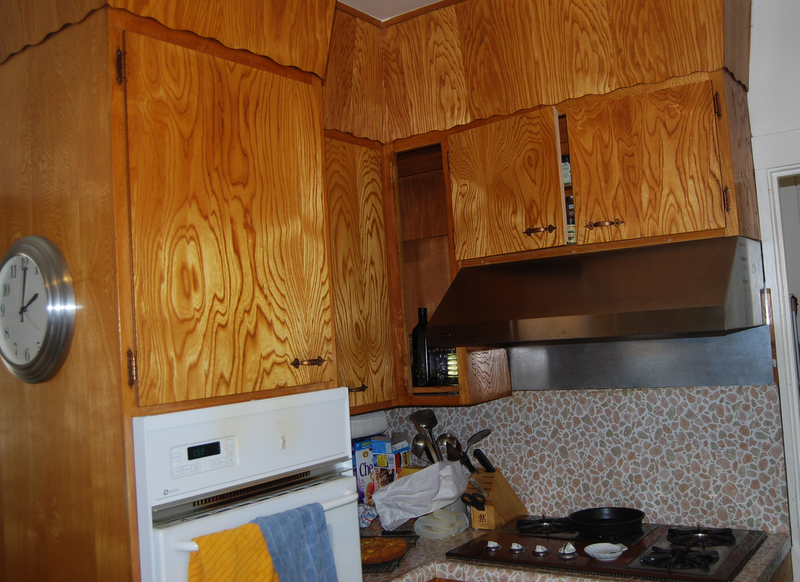 The cupboards are varnished 3/4-inch plywood, in great shape except the finish is way old and the hardware is that once-so-fashionable faux-French beaten copper stuff. 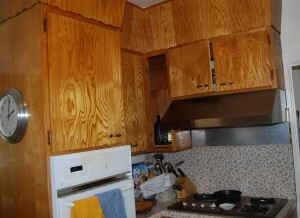 So, we’re painting the cupboards, changing out the counter tops, having the kitchen rewired, then tiling the backsplash. I took the shelf out, too. This place is going to gleam when I get through! We’re sticking a new stainless cooktop and sink in, and I installed the new hood a couple weeks ago. So really, we’re doing a semi-major job except the cupboards, and those we are painting ourselves. Alexandra figured out colors and hardware; I’m in charge of organization and production because I’m a nut about finishes, so I got started today, two weeks early, to get a shot at the process and get some of the work done. Another little-used cupboard. Note the new hood waiting for its bretheren. The white oven is getting old and will soon be the only non-stainless appliance installed. This dinky cupboard holds trays and cutting boards, so easy to do without until we get to the big job. The big plan is to take a week off starting July 10 to do whole shebang. We bought the appliances over the last month–they are sitting in the basement. 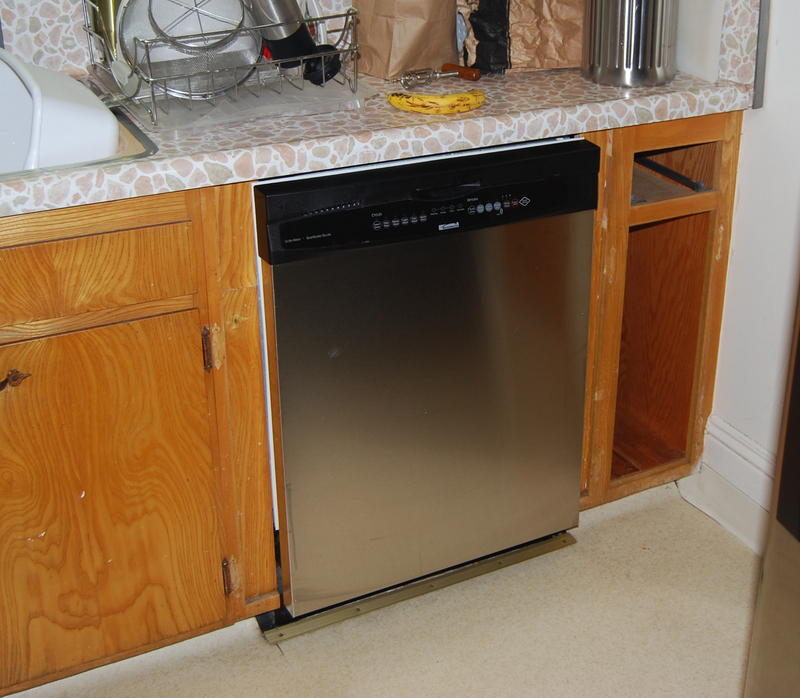 The fridge is a year old and the dishwasher two–both stainless. The oven is white and 6 years old–maybe we’ll end up doing that too, if we get another great deal at the Sears Outlet. They varnished after mounting the hinges when they built the cupboards. I find that odd. We’ve been to the paint store, we have the countertop picked out and the guys come measure next Thursday. 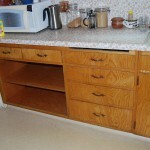 Things we have never done that we have to do: Remove the cooktop and sink, remove the countertop(! ), clean and prime the complete cupboad and drawer frame and fronts, including the insides of some of the cupboards and drawers, then mask off the rest of the kitchen and paint everything using a spray unit. Also, reconfigure the sink drain for a double sink (remembering the disposal, dishwasher and icemaker feeds), swap over the garbage disposal, install the sink and cooktop (the counter guys cut the holes-whoo hoo. ), install all the hinges on the cupboard doors and mount them to the proper cupboards (having been careful, hopefully, to not over-paint the edges so they still fit properly); put the handles on all the doors and drawers straight and, finally, tile the backsplash. I figure we’ll have a half day to spare on Sunday afternoon. 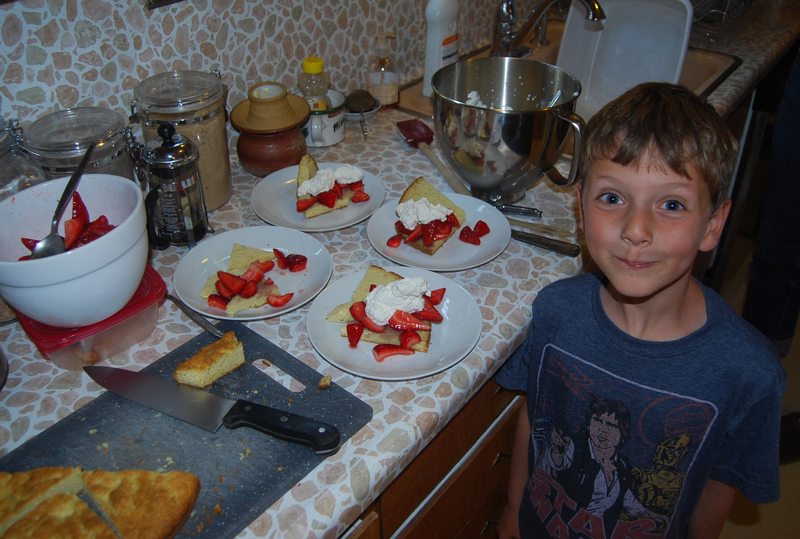 Alexandra requested something strawberry for her birthday, so I pulled this off epicurious. Made my first short bread. The dough was thicker than I expected--like pie crust dough, but it came out great. Synchronizing the various pieces is my job, and I figure if we can get a jump on the labor of the cupboards everything else will have a better chance of happening on time. 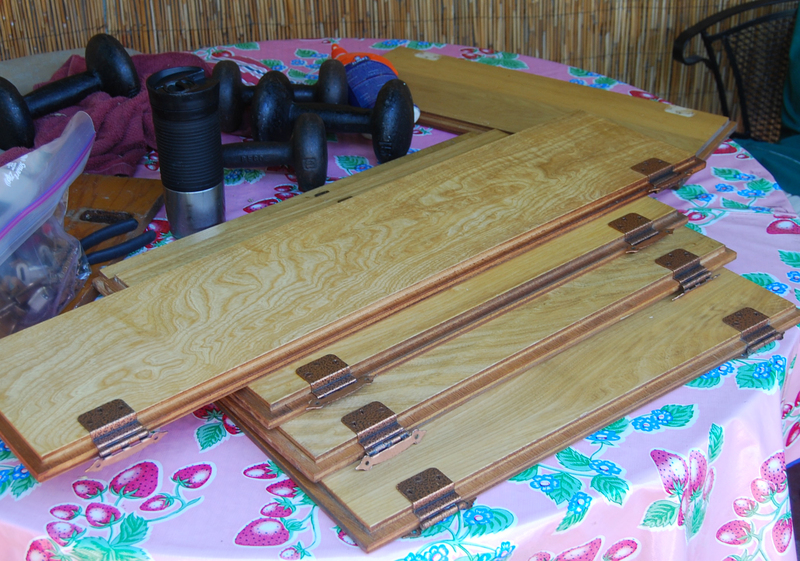 Therefore, I pulled the first 5 cupboard doors and two little-used drawers and TSP’d them this afternoon. He doesn't look a look a bit anticipatory does he! 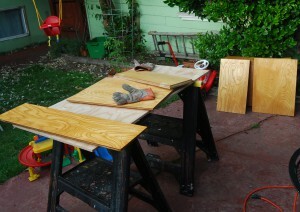 The day’s plan was to have those seven pieces in primer by the end of the day, but I dind’t quite make it. My good old B&D orbital sander has had a broken wire for the last two year and when I started out on this job with it, it kept cutting out. After a few minutes, I pulled the plug and took it into the bench. With John hanging out watching, I removed and loosened enough screws to work the wire boot out off the handle, slit the boot, spliced the wires and wrapped the whole thing in heat shrink tubing before re-inserting the boot and tightening the screws. The test was sucessful, but it was too late to continue working today. Tomorrow I’ll sand the pieces I have out and prime them, then stack them away until our week off. 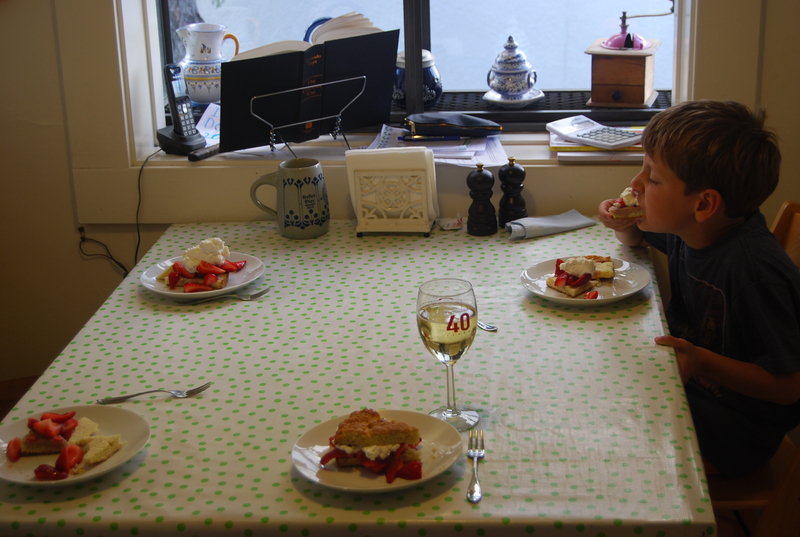 I’m proud to note that during all this testosterone-inducing work I remembered to make Alexandra’s birthday strawberry tart. I made shortbread, which isn’t very good unless it is soaked with fresh strawberry juice and sugar. It was really thick and I had to kind of pack it into the cake pan. Don't worry, I barked at him for not waiting. 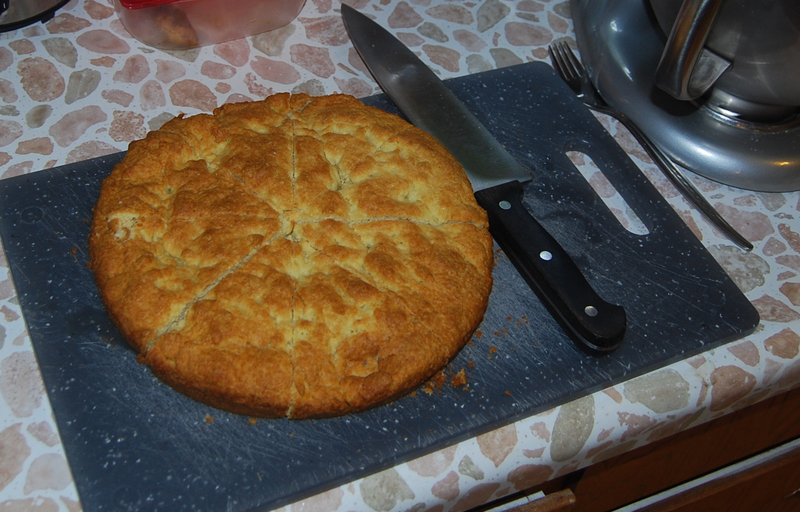 It came up perfect–golden brown, as you can see. When it came to cutting it in half horizontally to load it up, it behaved perfectly, too. The strawberrys were organic, from the farmers’ market and you just load them up with sugar and let them sit. Not a challenge. But I did make the whipped cream–the recipe called for granular sugar instead of powdered, and that worked out. Nina didn’t want whipped cream, but the rest of us enjoyed the treat. Rather diverse day in the kitchen for me, really. All washed with TSP, only one sanded, though. I decided to fix the wiring on the sander before I got a nasty shock or bolo'd it over the fence because it kept cutting out. Oh, how nice – I am the first one to leave a comment. I am glad that someone has a plan, man of many talents. I will have the rest of the delicious strawberry cake for lunch today!